We have all seen Google Slides used to help presenters through their presentations. It is great for that purpose. But I would like to share here some options for use that fall outside that way of thinking. 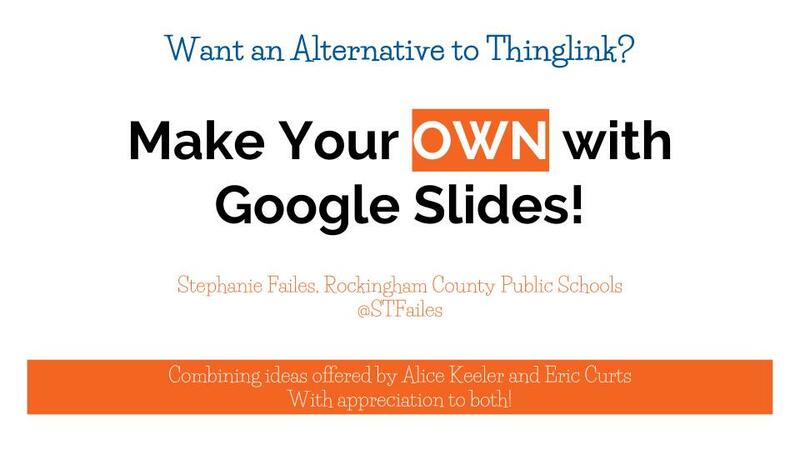 Google Slides can be a terrific tool for creating all sorts of neat products. The fundamental feature of an interactive presentation is a link. Students can create all sorts of experiences by designing products that let the user navigate through links and make choices about their experience. Here's how to link slides in a Slides presentation as well as link to an external resource. Along the way, we talk about a great resource for attractive Google Slides templates, Slides Carnival. USE BACKGROUNDS IN GOOGLE SLIDES FOR INTERESTING USES! Adding a background to a Google slide helps when you want to put content on a slide without worrying about the background graphic's sliding, moving, or even being deleted. Here's an example of creating a gameboard where the board is in the background and your board pieces then are manipulated on the slide itself. Winter Poetry (Eric Curts) -- put an image in the background and put words on other slides to copy/paste for students to use to create poetry. Consider putting graphic organizers in the background (some of these Google Drawings ideas from Matt Miller will work well!) so students can use them for critical thinking activities. This one is a great example for younger students. Create other kinds of game boards ... checkers/chess, for example. Make your own Thinglink! Assemble your image then put it in the background and put your hotspots on the slide. This is a great way for a student to organize and present information on a topic! This is a nice webinar by Eric Curts where he shows how to design a comic strip with animation in Google Slides. The skills and techniques he are great for any kind of Google Slides product, not just comics. He also recommends a really nice graphics resource, OpenClipart.org where he points out PNG files are great for use when you have background images or colors because that file format can support transparency while JPGs cannot. Also: Here's a simpler approach from Richard Byrne where he uses a table and puts images and callouts inside the table cells to create a simple comic strip.